You can edit exceptions in any of the coverage table templates. 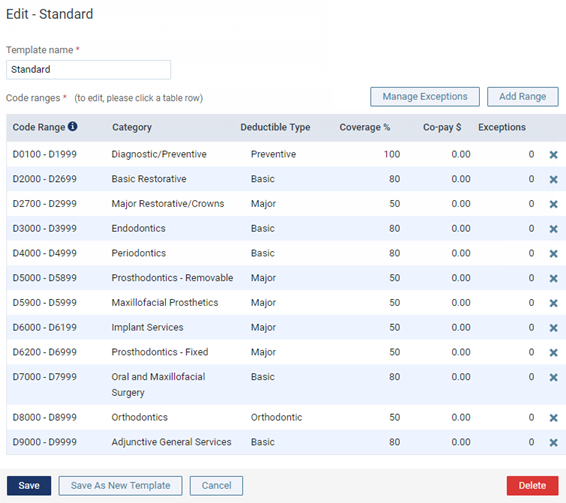 Tip: You can edit exceptions in a coverage table that is attached to an insurance plan and in a coverage table when you are editing an insurance plan that is attached to a patient's record. 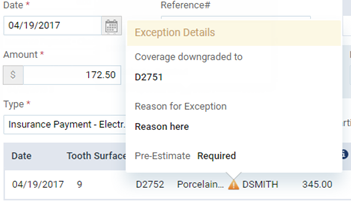 Note: The exceptions in coverage tables are used by Dentrix Ascend to automatically calculate insurance estimates. If a patient has dual coverage, the exceptions of the primary insurance coverage are used. Also, a posted procedure with an exception will have a warning icon next to it in the following areas of Dentrix Ascend: in the Enter payment dialog box, in the Enter credit adjustment dialog box, on the Payment tab of the Patient Walkout dialog box, and on the treatment plan case preview page. You can click a warning icon to view the details of the exception for the corresponding procedure. On the Settings menu, under Production, click (or tap) Coverage Tables. The Coverage Table Setup page opens. 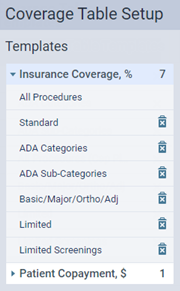 On the Coverage Table Setup page, select a coverage table template. The options for editing the coverage table appear. Click (or tap) Manage Exceptions. The Exceptions dialog box appears. 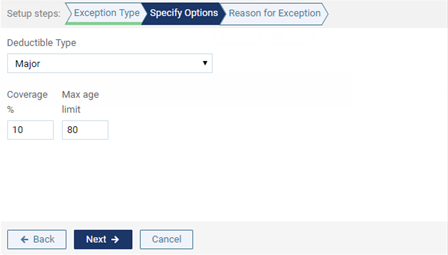 The options for editing the exception become available. Procedure code - To select a procedure, begin typing the code or its description, continue typing as needed to narrow the results, and then select a code. Exception type - Select one of the following options: Not covered, Downgrade, or Coverage with age limit. Pre-estimate - If the insurance carrier requires that a pre-treatment estimate (pre-authorization) be submitted before treatment can begin for this procedure, select the Required check box. For a Not covered exception type, there are no options on this tab. For a Downgrade exception type, begin typing the code or description of the substitute procedure to Downgrade coverage to, continue typing as needed to narrow the results, and then select the code. Deductible Type - Select the type of deductible that the patient must pay for this procedure. Coverage % - Type the percentage of the fee charged that the insurance carrier covers for this procedure. Max age limit - Type an age limit to specify that the insurance carrier covers this procedure for patients who are of the specified age or yonger. 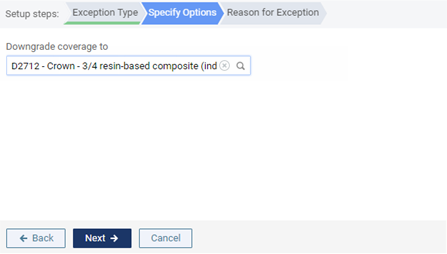 Type the reason for the exception in coverage for this procedure.